The Camino de Santiago packing ebook was carefully designed to give readers packing tips, weather advice and a dedicated Camino packing checklist. This guide will help you to prepare correctly for this epic journey. Whether you are planning to walk or cycle any of the Camino de Santiago routes packing your suitcase is a very different experience to the average vacation abroad. When our customers started asking questions and worrying about what to bring and what not to bring we came up with a plan to develop a comprehensive packing guide. Our outdoor clothing partners have given us special clothing advice. This packing advice is designed for anyone who is getting ready to walk or cycle the Camino de Santiago, whether it’s a week, a full month or longer. We recommend that you have a printed copy of the plan when you begin to pack your suitcase/backpack. 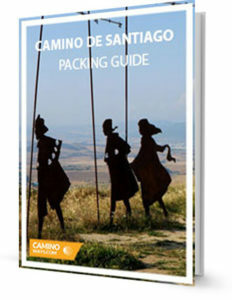 * Downloading your free Camino Packing guide you are registering to the CaminoWays.com newsletter.